NASA announced the launch date for the first test flight of a commercial spacecraft to the International Space Station today (Dec. 9). The mission, which will test a vehicle intended to carry cargo, and eventually crew, to orbit, represents an important step for the burgeoning private space industry, experts say. NASA gave Space Exploration Technologies (SpaceX) the formal go-ahead to launch its robotic Dragon spacecraft atop a SpaceX Falcon 9 rocket to the space station on Feb. 7, 2012, so long as a series of final safety reviews, testing and verification is successfully completed. "SpaceX is excited to be the first commercial company in history to berth with the International Space Station," SpaceX president Gwynne Shotwell said in a statement. "This mission will mark a historic milestone in the future of spaceflight. We appreciate NASA's continued support and their partnership in this process." 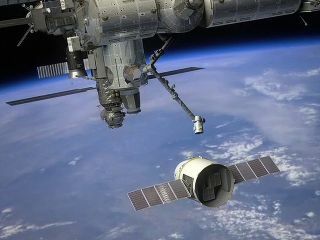 "SpaceX has made incredible progress over the last several months preparing Dragon for its mission to the space station," William Gerstenmaier, NASA's associate administrator for the Human Exploration and Operations Mission Directorate, said in a statement. "We look forward to a successful mission, which will open up a new era in commercial cargo delivery for this international orbiting laboratory." In the months to come, SpaceX will need to show that it has satisfied the agency's safety requirements, but NASA officials are confident that these conditions will be met. "There is still a significant amount of critical work to be completed before launch, but the teams have a sound plan to complete it and are prepared for unexpected challenges," Gerstenmaier said. "As with all launches, we will adjust the launch date as needed to gain sufficient understanding of test and analysis results to ensure safety and mission success." During the flight, the Dragon capsule will perform a round of tests of its rendezvous and docking system by initially completing a flyby of the space station to within approximately two miles (3.2 kilometers) of the outpost. This will allow the unmanned spacecraft to ensure sensors and flight systems are working properly for a safe rendezvous and approach. Flight controllers will also demonstrate the capsule's capability to abort the docking, if required, NASA officials said. The capsule will then approach the complex, with members of the space station crew doing their part by grabbing the spacecraft with the outpost's robotic arm. The Dragon will attach to the Earth-facing side of the station's Harmony node, NASA officials said. At the end of the mission, the capsule will be released from the station, and is expected to re-enter Earth's atmosphere and splash down in the Pacific Ocean off the coast of California. If the rendezvous and docking is not successful, SpaceX will try another demonstration flight at a later time to meet these planned objectives, NASA officials said. This will be the second flight for SpaceX's Dragon capsule. The spacecraft was launched atop the company's own Falcon 9 rocket in December 2010 on its maiden flight, and completed two orbits of Earth before splashing down in the Pacific Ocean. This landmark demonstration flight was the first time a commercial company launched and returned a capsule from space. "SpaceX is on the forefront of demonstrating how a partnership between the government and private industry can lead to new capabilities and provide a large return on investment," Alan Lindenmoyer, program manager for COTS at NASA's Johnson Space Center in Houston, said in a statement. Following the retirement of NASA's space shuttle program, several commercial companies are hoping to fill the cargo-carrying void left by the grounded orbiters. NASA's COTS program is aimed at fostering the development of a new fleet of private spaceships that will be able to deliver critical supplies and hardware to the space station and other destinations in low-Earth orbit. Orbital Sciences Corp is another private company developing a cargo freighter under NASA's COTS program. The Dulles, Va.-based firm is building its Cygnus spacecraft to carry supplies to the space station. Orbital will receive up to $288 million for the successful completion of their planned milestones, with the first Cygnus test flight expected in 2012.